Emily Carman finishes 8th in the Biathle World Championships in Spain! 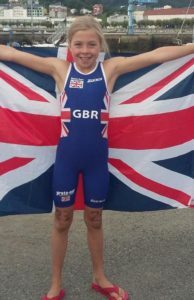 Having qualified over the summer, Emily travelled to Spain this weekend to compete in the under 11 age group in the Biathle World Championships. This involved a 400m run – 50m open water swim – 400m run. Emily completed hers in 4 mins 48 seconds, finishing 8th overall.